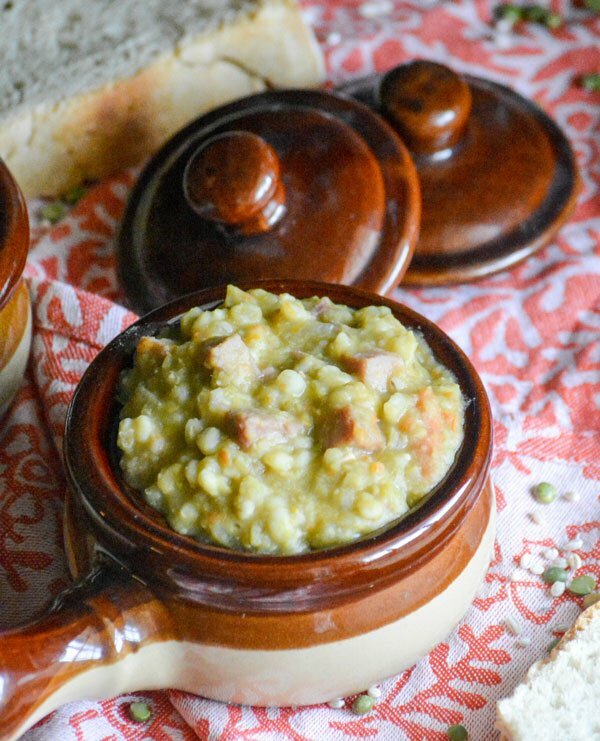 When the weather’s cold, rainy, or gloomy- this quick & easy Slow Cooker Split Pea Ham & Barley Soup is just what the Doctor ordered for dinner. 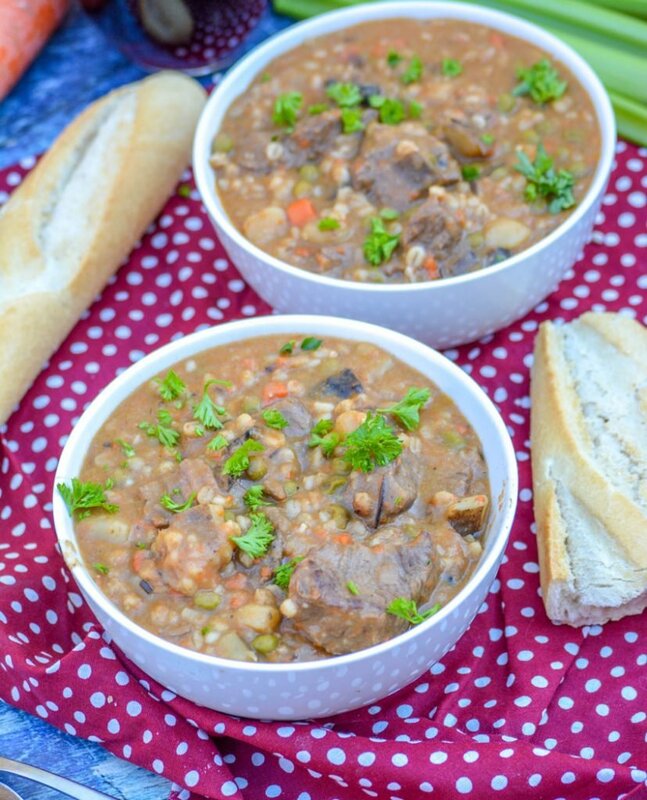 Loaded with hidden veggies, this healthy soup makes a hearty meal the whole family will fall in love with- even the kids! The hubs and I met on a blind-date, set up at the last minute (5 minutes before closing time) by my co-worker (now FIL). It may sound cliche, but that one night was all it took for us to know it was love. We literally talked all night long that night, the first of many to come over the next few months, closing down a restaurant and then sitting in the parking lot until the wee horus of the morning. One of the first things we discussed was religion. It was important to both of us, and we discovered that while we were both Christians we represented very different denominations. The hubs is Catholic, and I’m southern Baptist. Our families’ were pretty skeptical, especially if we decided to have children. They said it couldn’t be done, but we managed to do it anyway. Part of us making it work is understanding and supporting the others beliefs and practices, even if under other circumstance we wouldn’t share them. We’re in the season of Lent and my husband cannot eat meat on Fridays. Therefore, our family cannot eat meat on Fridays. While this may be an easy sacrifice, for the sons it’s still kinda scary. They imagine without meat that they will waste away in the night. Despite their worries, meatless meals don’t have to equate to rabbit food, as I’m determined to prove to them. A good risotto can take your mind off of any problem. A secret for all my risotto-lovin’ freinds… risotto cooking methods will work on just about any grain. I’ll give you a minute to digest that information. Whether you’re looking for meatless meal options, like us, for Lent, or you just want to change up your regular menu and experiment, or even if you’re vegetarian, packed with protein and quite satisfyingly filling, this meatless meal doesn’t disappoint. 1. Heat oil in large saucepan over medium-high heat. Add carrots, garlic, cauliflower and onion. Cook until vegetables being to soften, about 5 minutes, stirring occasionally. 2. Stir in thyme and barley; cook 2 minutes, stirring frequently. 3. Transfer mixture to slow-cooker bowl. Stir in garbanzo beans, broth, water, salt and pepper. 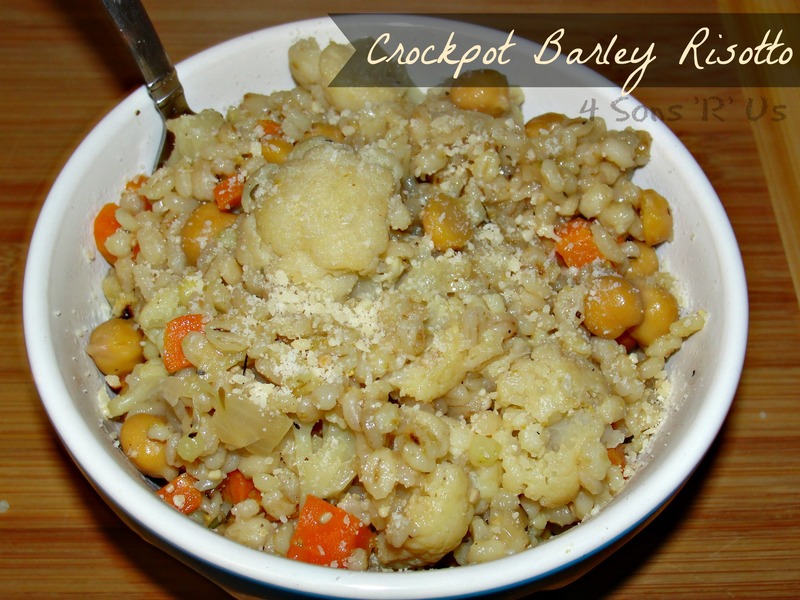 Cook on high 2 to 2-1/2 hours or until barley is tender and most liquid is absorbed. 4. Stir in lemon juice. Serve in warm bowls garnished with cheese and parsley.